On the front page of Sunday’s New York Times, reporter John Eligon investigated racial inequality through the lens of fair housing. Specifically, Eligon looked at how Housing Choice Vouchers, which are supposed to help low income families find places to live in safe, high opportunity neighborhoods, rarely provide much choice to voucher holders. Instead, families with vouchers are usually forced to choose from limited housing options in low income, segregated communities. In “A Year After Ferguson, Housing Segregation Defies Tools to Erase It,” the anniversary of the death of Michael Brown, the black Ferguson, Missouri teenager whose killing by a white police officer triggered local unrest and national attention last summer, is connected with discrimination against voucher holders in the surrounding St. Louis area. Beyond the pressing issue of racialized police violence, the ongoing conversation about Ferguson has also focused on the conditions that created the segregated, divided community where Brown was raised and killed. This is critically important: As Eligon notes, the Census tract that includes some of the neighborhood where Brown lived has more Housing Choice Voucher holders than any other in the state of Missouri. Ferguson is largely segregated, with African-American residents mostly living in concentrated poverty. And neighborhoods like Brown’s are typically the only places where apartments are open to voucher holders, 95 percent of whom in the St. Louis area are black. Eligon interviewed an African-American mother in St. Louis who was thrilled to receive a voucher until she realized that her only housing options were located in the same kinds of low income, segregated neighborhoods where she already lived. That’s due to a number of factors, including discrimination from landlords who don’t want to rent to the predominantly black population of voucher holders. Here in Texas, we know all too well about the consequences of landlord discrimination. Segregation of voucher holders is a problem nationwide – the Times also published maps of several American cities, showing that minority voucher holders almost always live in low income neighborhoods. One solution to the problem can be source of income protection laws, which ban landlords from refusing to accept vouchers. The City of St. Louis recently passed such an ordinance, and the Ferguson Commission created in response to Brown’s death suggested that the Missouri Legislature prohibit voucher discrimination statewide in order to reduce segregation. The Texas Legislature, on the other hand, recently did the opposite. A bill passed earlier this year stops any city or county from adopting a source of income protection ordinance, in response to the City of Austin doing so in 2014. Despite rampant landlord discrimination against Austin’s voucher families, the state government voided the local law. 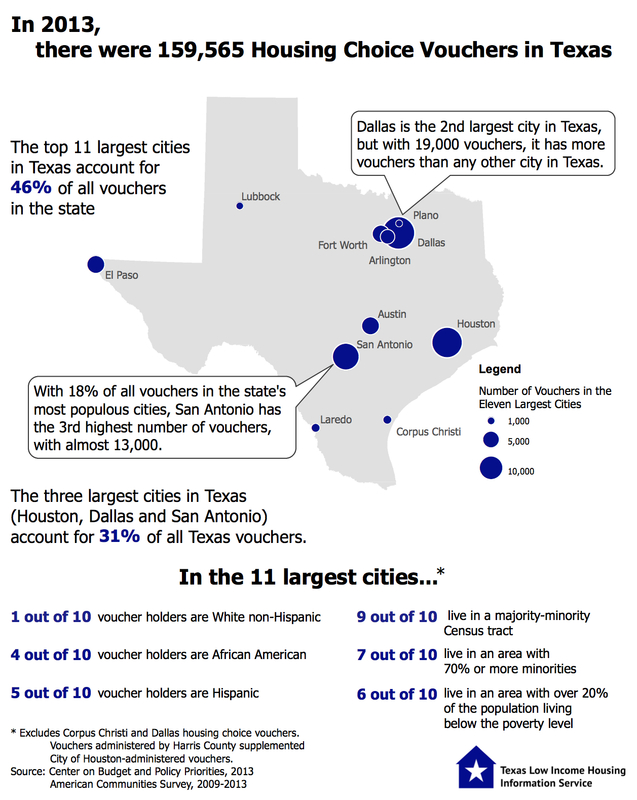 As the graphic above shows, nine out of 10 voucher holders in Texas are African-American or Hispanic, and nine in 10 live in majority-minority neighborhoods. The national disgrace of voucher discrimination perpetuates racial segregation, trapping families of color in isolated areas that often lack good schools or quality services. And segregation, in turn, produces distrust and tension that can lead to violence. Local governments must do more, not less, to combat segregation’s effects on communities. The new federal fair housing rule, requiring increased effort at the local level, could be a good start, as could the Supreme Court’s recent decision to uphold the Fair Housing Act as a powerful tool against institutionalized discrimination. Texas’ source of income protection ban, however, only pushes low income families of color further into the margins. The Times story is an important reminder of what a tragedy that is. This entry was posted in National issues and tagged Ferguson, racial segregation, Racism, source of income. Bookmark the permalink.